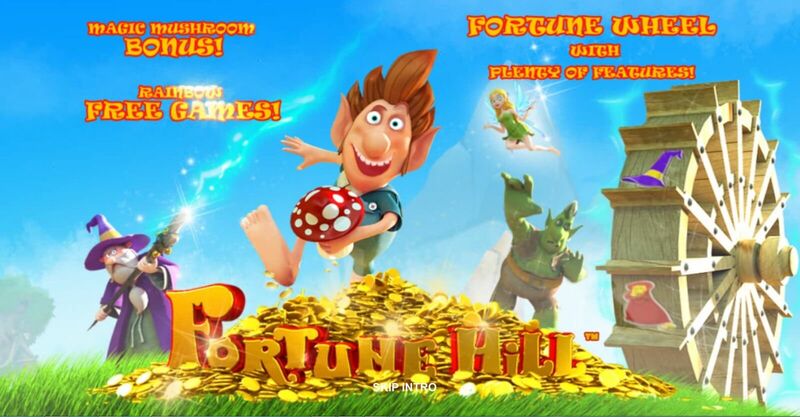 Fortune Hill is an online slot game that has a magical fantasy theme and brightly coloured graphics. The game begins with an introductory film which tells the story that the slot is based on. It was developed by Playtech and has a five reel and three row grid with twenty five pay lines. Fortune Hill online slot game features an auto play button which can set the reels to spin a predetermined number of times and a turbo mode function which will have the game play faster by deactivated certain features like the winning animations and so on. The Fortune Hill reels are transparent and are set alongside a watermill on a grassy landscape with a mountain peak in the far distance. An elf stands to the left of the reels in front of his hut and the wizard’s tree house is seen further off. The function buttons below the reels are made up of rocks and a small wooden bridge along a river. The graphics are bright and colourful and feature the characters in a cartoonlike way. They come alive with animation when a winning combination lands and when certain character symbols appear on the reels. The Fortune Hill watermill acts a wheel of fortune where after every spin the indicator will point to a section on the wheel. Some of the sections hold special icons that award specific prizes. The wizard’s hat is worth three re-spins that come with freezing reels and extra wilds. The money bag gives a random money prize worth anything up to 6x the initial bet. The wand awards either a random money prize or expanding wilds that will appear on the second and fourth reels. The watermill also can award multipliers of up to 4x. The magic mushroom symbol appearing on reels one and five simultaneously will activate the mushroom bonus game. The aim is to help the elf steal mushrooms from the ogre’s cave. Every mushroom selected will award a prize and the game will end when a picked mushroom reveals a mole which will wake the ogre from sleep. The rainbow symbols need to appear on the first, third and fifth reels simultaneously to get eight free spins initially. If the Fortune Hill watermill awards a multiplier on the activating spin then the multiplier is set in place for the duration of the free spins round. The watermill also has additional sections that may award a further two; three; four or eight free spins after every spin. With all of these epic bonus features, this is by far one of the most exciting online slots Australia and other regions have to offer. The Fortune Hill online slot symbols include the standard nine to ace playing card icons which make up the lower valued symbols; a pipe; a pocket watch and the main characters the wizard; the elf; the fairy and the ogre. The wizard is the highest valued symbol that awards the jackpot prize of 5 000 coins and he acts as the game’s wild symbol. The free games rainbow symbol activates the free spins bonus round and magic mushroom symbol activates the bonus game. All winning combinations must have landed on an active pay line to pay out and must be three or more consecutive symbols running from the furthest left reel. The highest valued combination pays for multiple wins on one pay line but wins on multiple pay lines are accumulated and paid out accordingly.